The Libyan struggle will likely go on for some time, but the so-called stalemate did witness some movement on Tuesday. Indeed, NATO announced the inauguration of a Phase 2 of the war. 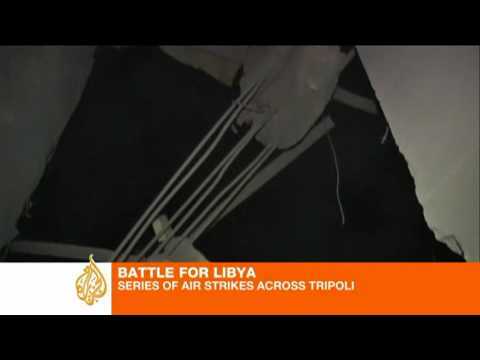 NATO jets hit further command and control sites in Tripoli, the capital. They also hit Qaddafi brigades positions in western Misrata. At the same time, the Free Libya forces report that they were able completely to take the airport, and to push the Qaddafi brigades 10 miles out of the city. AP also reports this assertion , saying that after two days of fierce fighting, the Free Libya forces had completely pushed the loyalists out of Misrata’s airport. The Misrata fighters are also said to have taken the nearby town of Zareek. According to Benghazi radio, “The Voice of Free Libya,” as translated by the USG Open Source Center, “Press sources say rebels flew flag of independence over Mitiga airbase in Tripoli after security officer provided them with light weapons.” The radio says that there are defections from Qaddafi in the capital. @Feb17voices on Twitter is carrying tweets saying this report is a misunderstanding or exaggeration, and, rather, people at the base were waving the old pre-Qaddafi flag. Chris Stephen of the Irish Times reported from Ajdabiya that NATO and Free Libya forces coordinated a battle plan against Qaddafi armor outside the city. The Free Libya forces made a push against the loyalist lines, heading west. When Qaddafi brigades mobilized tanks and armored vehicles to riposte, the Free Libya fighters withdrew to a pre-arranged ‘no-fire zone.’ The advancing tanks were then intensively bombed by NATO. Compared to the reckless, unplanned advance of forces from Ajdabiya west in early March, this operation seems to have been well-planned and professional. Meanwhile, US aid arrived in Benghazi, including 10,000 meals ready to eat or military rations.